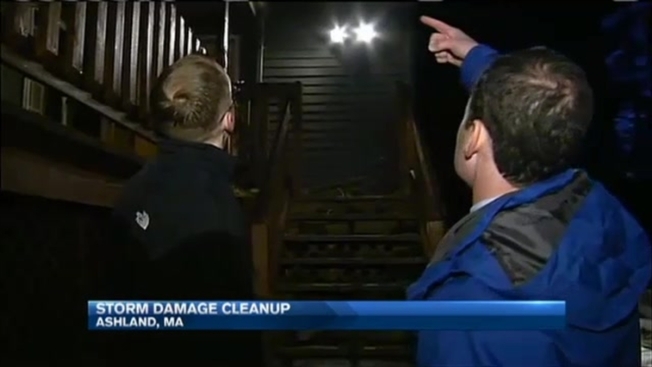 Wild weather, including wind damage and hail, caused problems across New England on Tuesday. The National Weather Service issued wind advisories across areas of Massachusetts, Connecticut, Rhode Island, New Hampshire, and Maine. Winter weather advisories were also issued. A small stretch of busy route 135 in Ashland, Massachusetts, remains shut down Tuesday night, several hours after a tree came down on some power lines due to strong wind gusts this afternoon. A hole in the ceiling, when the top of a pine tree pierced its way through, sending debris into Jaron Lariviere's Ashland bed room. But he soon realized he had more to worry about than that. "Apparently they settled on the gas meter or the gas line and kind of snapped them, at one point. And it was a while before I smelled anything. I just happened to be downstairs and and smelled it," Lariviere said. He and his 7-month-old daughter quickly evacuated the condo along with some neighbors. The tree crews arrived as did the gas company. Down Route 135 in Ashland, the road was closed down when a pine tree fell onto some power lines, firefighters made their way through to Jaron's home. And not far away, in Holliston, those same strong winds snapped off this large limb onto Ashland Street, which crews got to the side of the road. The storm was not confined to MetroWest though. A tree made a huge hole in the roof and side of this home in Wilmington, and smashed the windshield of the car. Another tree blocked Travis Street in the Allston section of Boston. Loring Road in Lexington was impassable, as well. Meantime, back in Ashland, no one was hurt, but it's getting cold, and Jaron's hoping for some heat. "They (the gas crew) were just here, went through the unit, said everything's fine. They're coming now to actually replace and fix the line to the house so, in theory, we have heat tonight," Lariviere said. People do have electricity along 135. The road has already been closed for more than three hours. It's unclear when it will reopen.